There's a time and place for every debate. But this Thanksgiving, we’re reminded that democracy is a discussion. If the occasion arises, we encourage you to have an authentic American discussion. Did you know that the term talk turkey was first recorded in the early 19th century, and originally it had a much different meaning? Americans at the time used the phrase to describe “speaking agreeably” or “saying friendly things.” One theory is that this original definition emerged from the nature of family conversation around the table at Thanksgiving. Today, of course, it means to speak frankly, to discuss hard facts, or get down to serious business. Which, following a hard-fought midterm election like the one we Americans just experienced, also is likely to occur around Thanksgiving tables this Thursday. Turkey Day tension is not new, though some might argue it’s rapidly intensifying in our current political climate. A recent study found that in 2016, politically divided families cut their Thanksgiving dinners short by a half-hour to 50 minutes. This year, with some races still not called around the country, some of us might be considering skipping out on family gatherings altogether. Advice on how to avoid arguing at Thanksgiving is plentiful. And avoidance of difficult, even contentious, topics is certainly one way of going about things. While we agree that there is a time and place for every debate, we’re reminded that American democracy is, at the end of the day, a discussion. Our republic was founded on an argument, and it’s as American as baseball, hot dogs, apple pie and Chevrolet to continue that discussion as we continually work toward a more perfect union. So this Thanksgiving, if the occasion arises, we’d encourage you to not be afraid to have an authentic American discussion. If it wades into political territory, well, we’d also submit that that is OK. But, civility! That word has been on a lot of Americans’ lips as the nation’s political temperature has steadily risen this year. 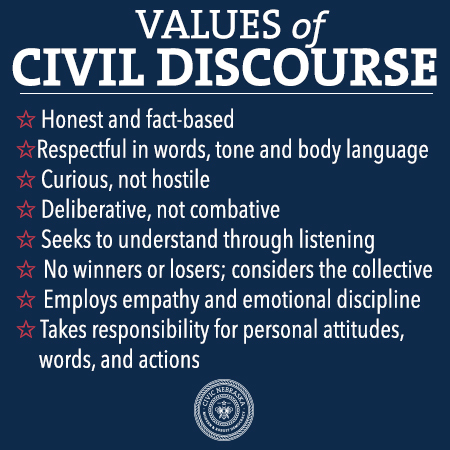 We agree, civility is the key to meaningful discourse – there’s no reason to escalate a conversation into an argument around the table before the pumpkin pie can even get sliced. As an organization that often is asked to share our expertise about civil discourse, we’d also share a reminder that technically, civility and politeness are two different things. Politeness refers to courtesy and decorum. There’s nothing wrong with those things, of course, unless they’re adhered to so stringently that they lead to the avoidance of confronting difficult topics to the detriment of the entire group. Civility and civil discourse, meanwhile, are based on facts and honesty, involve listening as well as speaking, and assumes that each participant ultimately has the other’s best interests – and the best interests of our wider society – in mind. That last one is big, especially in an era where cable news tells us we’re “more divided than ever” and that we reflexively see the other side as “the enemy.” Instead, we try to think of it as a group of Husker fans watching their team with the ball on third and four, discussing the best way for the Big Red to pick up a first down. Maybe one group thinks a running play would be the way to go, but the other group believes a pass would stand a better likelihood of success. We may disagree on details — at times, about big fundamental things like who should be the team’s coach. But in the end, we’re all on the same team and want the Huskers to succeed. Earlier this year, after a notable incident prompted the word civility to rush to the front of Americans’ lexicons, we shared three guiding questions to consider in a difficult situation that may help you discover a healthy dialogue with others around the table this year. As the holiday season kicks off in earnest this week, it’s a good time to revisit them. Civil discourse doesn’t have winners and losers. There is no scoreboard in a conversation that aims to be constructive. Rather than drive someone away from the dinner table, a more productive outcome would be to invite them to sit down, explain their position, listen, and then provide your perspective on the issue. Civil discourse is fact-based and honest, which provides a pathway to common ground. Your conversations must first start with a genuine attempt to understand the logic and emotion behind another person’s beliefs – civil discourse can’t happen without it. This doesn’t mean you have to accept someone’s beliefs or “alternative facts” as your own. But understanding always helps spur the conversation, and potential solutions, forward. One of the hardest things to witness is a conversation that breaks down and creates a seemingly impassable divide. Family dinners can be unbearably uncomfortable when your aunt, grandpa, cousin, or stepsister have wildly different belief systems than you. It’s important, though, to remember that persuasion happens over time. If your aunt, grandpa, cousin, or stepsister don’t agree with you right away, that’s OK. Rather than taking pains to avoid one another for the rest of the day – or the rest of your lives — take time to examine where your beliefs diverge, why that might be, and then revisit the conversation when it’s more appropriate. So, if the discussion around the table turns political, one option could be to fill your mouth with poultry. Another is to have a good, democratic discussion. In other words, feel free to talk turkey. Learn more about Civic Nebraska’s Civic Health Programs.